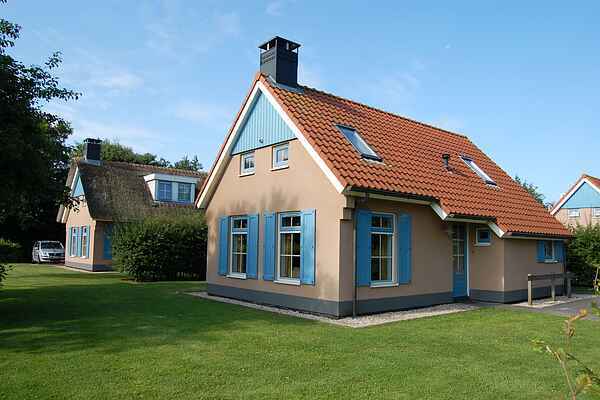 The different types of accommodations are spread over the well-stocked Texel Coast Park. There are three different free-standing variants to book. There are the country houses, chalets and modern, single-storey bungalows. The country houses built in maritime style are in four types; the 6-pers. (NL-1796-07) and 4-pers. (NL-1796-08). These houses feature box-spring beds and are somewhat wider than the standard 6-pers. variant (NL-1796-09). You have a dishwasher and combo-microwave. Single 6 pers. houses have a cozy atmosphere (gas) or wood stove. A small number of houses of this type has a bedroom with bunk beds on the first floor instead of two single beds. beds. Most 6-pers. country houses have a bedroom and bathroom on the ground floor. Finally, there's a completely refurbished villa (NL-1796-40). This is the same villa as the NL-1796-08, but completely refurbished. It's equipped with a smart-TV, modern furniture, two bright bedrooms furnished with single box-spring beds and two loungers on the terrace. The interiors of the bedrooms and bathrooms might differ from villa to villa. There are also furnished two-bedroom chalets, combo-microwave and box spring beds (NL-1796-28). Lastly, there are luxury and single-storey three-bedroom and two-bathroom bungalows (NL-1796-29). Two of the bedrooms have box spring beds. The third bedroom has a bunk bed. Of course a dishwasher and microwave are present. Whichever type you choose, you always have a garden with terrace and garden furniture. There is space for one car at each accommodation. At the chalets you park your car at central parking places near the chalets.